An earthly life of service ended. The men & women of the Abilene Police Department share in the sadness of yet another L E loss. We pray comfort to family, friends, & coworkers as you grieve this absence. We stand united in gratitude for service and commitment rendered by Deputy Sheriff Jacob Keltner. Our thoughts and prayers are with you, your family and the McHenry County Sheriff's Office. May God Bless and we thank you for your service! Rest In Peace... we will take it from here. You will always be a hero to me and every citizen you protected and served in your career. You made a community come together and forced people to realize how dangerous law enforcement is. No job too difficult no sacrifice too great. Sheriff Keltner, your two young children will grow up not knowing their dad but what they will know about you is your bravery and dedication to your selfless protection of your community. Our Lord will take care of them and you will be rewarded abundantly. May He immerse you and those you've left behind in His Divine Mercy. Rest in peace, good and faithful servant. Rest in Paradise Brother Keltner. Prayers to your family, friends t co-workers. May our God in heaven hold our hero softly in his hands. So very sad for this great man' tragic passing and his most beloved family, department, and friends. May his soul rest for eternity. God bless all of active L.E in our great country. We will never be the same without you. I miss you so much. Rest well, partner. God bless you and your family. To your family, stay strong and remember all of the good times you had. McHenry County stay strong, LCSO is mourning for you all. Thank you for your service Officer ,Condolences to your Family .Rest In Peace. Rest in peace my brother. Our thoughts and prayers are with you, your family and the McHenry County Sheriff's Office. Rest in Peace Brother. Prayers for your family and friends. Rest in peace brother, we have the watch now. Thank you for your service, you will not be forgotten. God bless the family, friends, and co-workers of Deputy Keltner during this time of tragic and senseless loss. 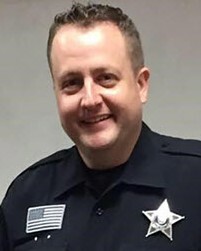 Lord God, our hearts and prayers go out to the McHenry County, Illinois Sheriff’s Office and for the family, friends, and colleagues of Deputy Sheriff Jacob Keltner, of the McHenry County Sheriff’s Office, who was shot in the Line-of-Duty on Thursday, March 7, 2019. Depart, dear brother-in-blue, out of this world into the arms of the Father who created you, into the arms of the Son who redeemed you, and into the arms of the Spirit who made you whole. You fought the good fight. Now rest in peace. Amen. God bless you and your family, you were cherished a a defender of the faith. May peace be with you always.